WebOP-2000G is an industrial data gateway, including WebAccess/HMI Runtime and 1GB industrial grade SD card for data storage. This gateway features dual power inputs to shorten the downtime to enhance operation stability. WebOP-2000G equipped with versatile I/O interfaces that can easily connect PLCs, controllers, I/O devices and PC/Server for data transmission. 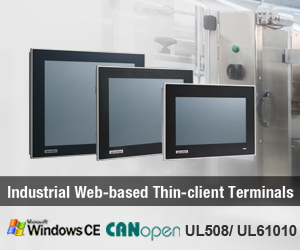 User can edit programs on PC/laptop through WebAccess/HMI Designer and execute on built-in WebAccess/HMI Runtime for data acquisition, exchange and uploading. This user-friendly, reliable solution is able to collect production data completely for analysis to increase efficiency significantly and optimize the manufacturing.